Preparation time: 3 minutes. Cooking time: 15 minutes. Spray large skillet with nonstick cooking spray. Heat over medium heat, then add pork chops to pan so that they are not touching each other. Brown pork chops on both sides, approximately 2 minutes on each side. Core apples (leaving skin on), then dice to yield approximately 1 1/2 cups. Sprinkle apples into hot skillet. In a small bowl, combine maple-flavored syrup and water and stir until well combined. Pour liquid into skillet, and cover. 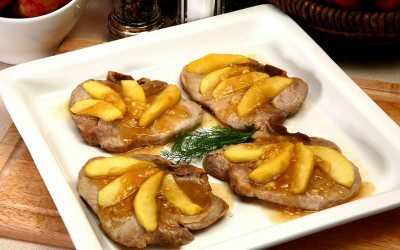 Cook approximately 5–7 minutes on medium heat until pork chops are cooked through and internal temperature is 160˚F. Serving size: 3 1/2 ounces meat.